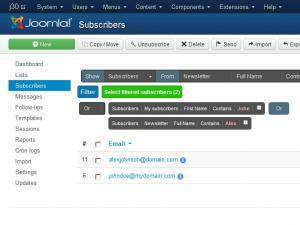 No export feature was included for importing/exporting the email messages, as you can easily migrate them by simply copying the HTML and plain text versions to a TXT file and manually adding them, from there, in your Joomla! 3.x website. Things will get a little more complicated if you have referenced, in your messages, Joomla! Content articles or Joomla! Registration information (through the use of placeholders). In this case, you need to make sure to also transfer the database tables that are related to these default Joomla! functionalities. Make sure to install the latest RSMail! version on both websites before performing any of the steps described below. head to Components >> RSMail! >> Subscribers. 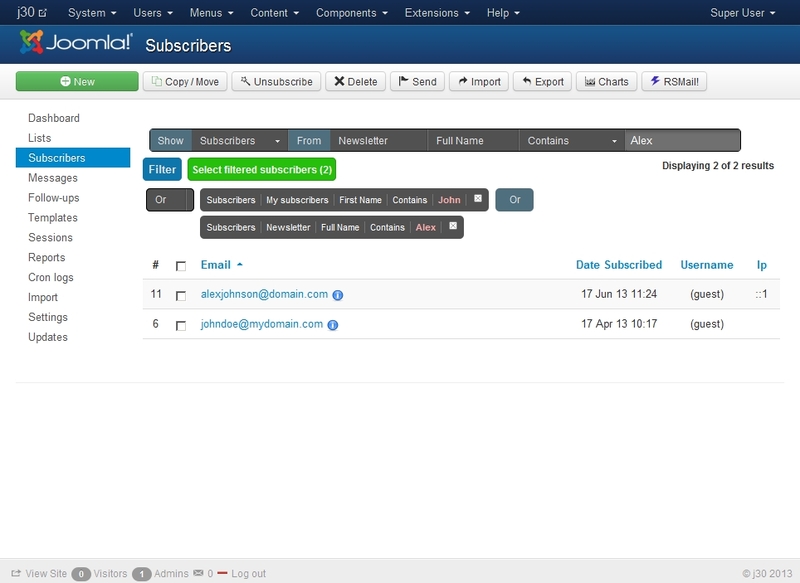 in the search filter, select Subscribers in the Show field and a list in the From field. Then click on Filter. Click on the green Select filtered subscribers button. It is recommended to use this button instead of the checkbox found in the listing's header as, if multiple pages of subscribers are found, the checkbox only selects the visible subscribers, whereas the Select filtered subscribers button selects the entire listing. Click on Export to the top side of the screen. You will be prompted to choose a location for the CSV file to be saved in. The process described above needs to be repeated for each of the lists you wish to migrate. RSMail! 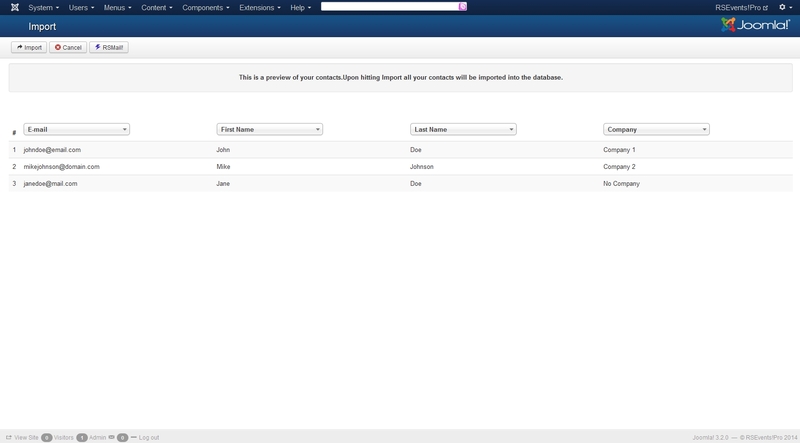 will now prompt you to associate each column found in the exported file with a field contained in the previously selected list. This is done in the same manner as described above, with the only difference being that you need to first update RSMail! 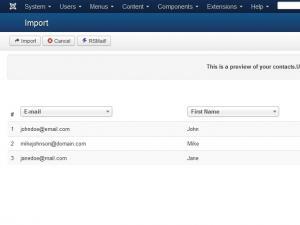 on the Joomla! 1.5 website to the latest version available for Joomla! 1.5 - rev. 18.